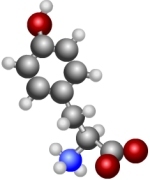 In our body, the amino acid Tyrosine (TYR or Y) is an aromatic a non-essential proteinogenic amino acid, coded codons UAC and UAU, derived from phenylalanine by hydroxylation in the para position. In our body's brain, Tyrosine (Tyr) functions as precursors (substrate) for the catecholamines [dopamine, norepinephrine, epinephrine. In protein science, as a phosphoamino acid, Phosphotyrosine is an amino acid that occurs in endogenous proteins. Both tyrosine phosphorylation and tyrosine dephosphorylation play a role in cellular signal transduction and possibly in cell growth control and carcinogenesis. In and from our body's thyroid, Monoiodotyrosine (Iodotyrosine) is a thyroid hormone precursor biosynthesized by iodizing tyrosine. In biochemistry, Melanins are a group of natural biological pigments usually derivative from the oxidation of the amino acid tyrosine followed by polymerization, that may be broadly classified as allomelanins when produced in plants or phaeomelanins when produced in animals. In our body's cells, Melanin found in peripheral tissues is produced within membrane-bound organelles, termed melanosomes, located in Melanocytes cells. In our body, there are two types of Melanin originating from Melanocytes cells: the Eumelanin and the Pheomelanin in the hair skin and eyes. Neuromelanin another Melanin type synthesized via a different pathway is found in the brain. In our body, the amino acid Tyrosine has demonstrated improvement in both the Brain's cognitive performance and balancing Blood Pressure (systolic). In protein science, Dihydroxyphenylalanine is a beta-hydroxylated derivative of phenylalanine, with the molecular formula of (C9H11NO4). Dihydroxyphenylalanine may refer to either of two compounds: the neurotransmitter precursor L-DOPA as (S)-3,4-dihydroxyphenylalanine a physiologically active substance, and the biologically inactive substance D-DOPA as (R)-3,4-dihydroxyphenylalanine.